Reporters Without Borders (RSF) condemns Indonesia’s double dealing, hosting the 24th annual celebration of World Press Freedom Day in Jakarta with UNESCO while continuing to harass independent journalists in West Papua, the Indonesian half of the island of New Guinea, with impunity. Yance Wenda, a photographer for the local news website Jubi, was arrested and beaten by police yesterday, the eve of World Press Freedom Day, while he was covering a peaceful demonstration in Sentani, a suburb of Jayapura, West Papua’s largest city. After being held for four hours, Wenda told the BenarNews website that the police began hitting him with “hands, guns and cane” without giving him a chance to show them his media assignment letter. Jayapura police chief Gustav Urbinas acknowledged that Wenda was arrested but denied that the police hit him. Wenda nonetheless took photos of his injuries and posted them online as evidence of the police brutality. Indonesia is ranked 124th out of 180 countries in the 2017 World Press Freedom Index that RSF published on 26 April. It is not unusual for both local and foreign journalists to be threatened anonymously or by the authorities and to be forced to censor themselves. Last week, the West Papua police seized TV reporter Richardo Hutahaean’s camera and deleted its contents. Hutahaean, who heads an association of Papua TV journalists, and two colleagues also received death threats after a covering a court hearing on a dispute between local politicians. 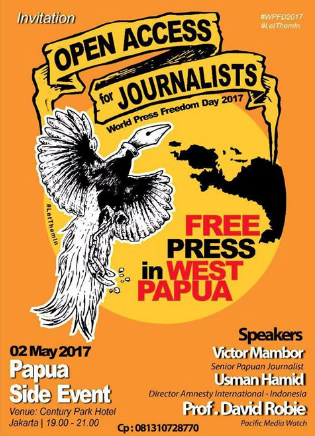 Because of the alarming media freedom situation in West Papua, the harassment of journalists and the frequent refusal to give press visas to foreign journalists, human rights organizations plan to protest during the events organized by UNESCO and the Indonesian government in order to press the international community to react. RSF expresses its support for the Legal Aid Centre for the Press (LBH Pers), which organized a public discussion on media freedom in West Papua on 2 April. The foreign media are usually prevented from working in West Papua and on the rare occasions when they are allowed to operate there, they are kept under close surveillance. French journalists Franck Escudie and Basile Longchamp were deported on 17 March after arriving in West Papua to film for a documentary. Another French journalist, Cyril Payen, was refused permission to return to Indonesia in 2016 after France 24 broadcast a documentary he had made about West Papua, entitled “Forgotten war of the Papuas.” He had had nonetheless obtained all the necessary authorizations before visiting West Papua to film for the documentary in 2015.